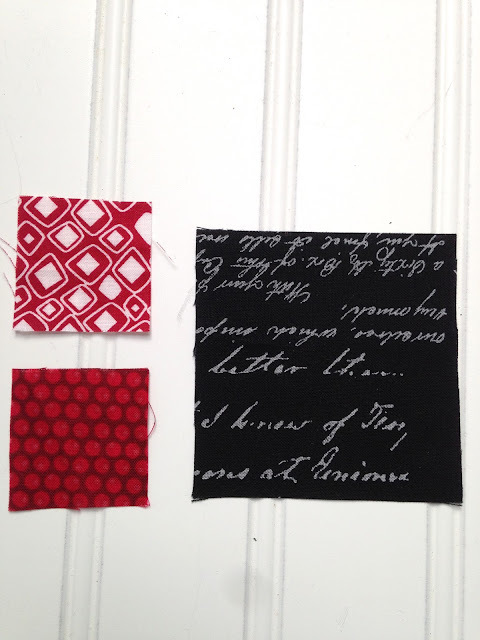 The first week of color for the #bescrappy was red! 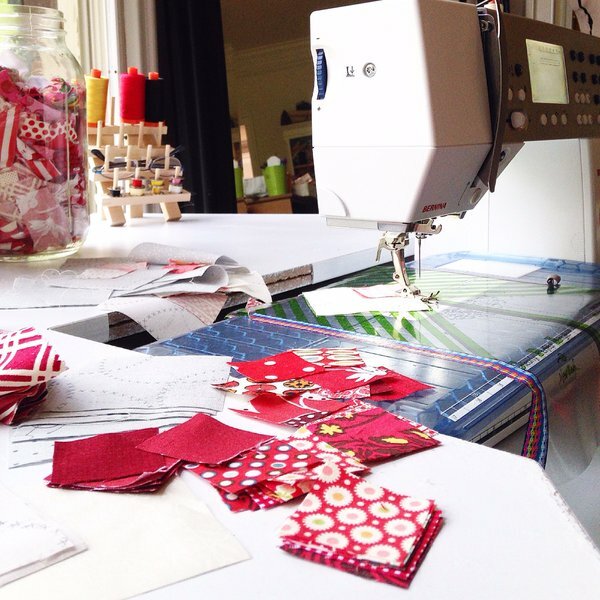 Red is my color of choice when it comes to quilting. While it is not my number one most favorite color, it is possibly my one and a half color but not quite my number two. If there is an in-between favorite color this is IT for me! To whittle down my red scraps, I started just cutting and sewing. I am loving how the red cream and gray looks up on the design wall! My intent was not to make a full quilt but that is the direction this project is taking. 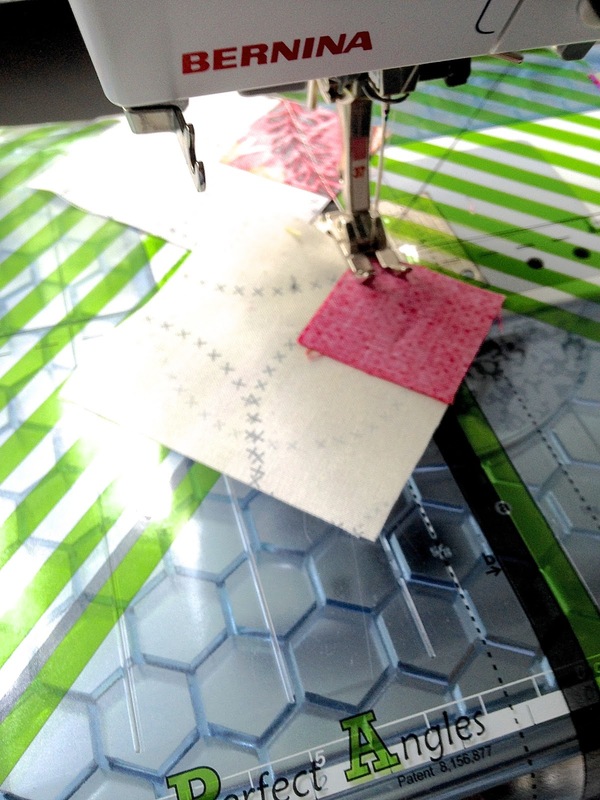 I decided to make a fast quilt block tutorial for this simple block! 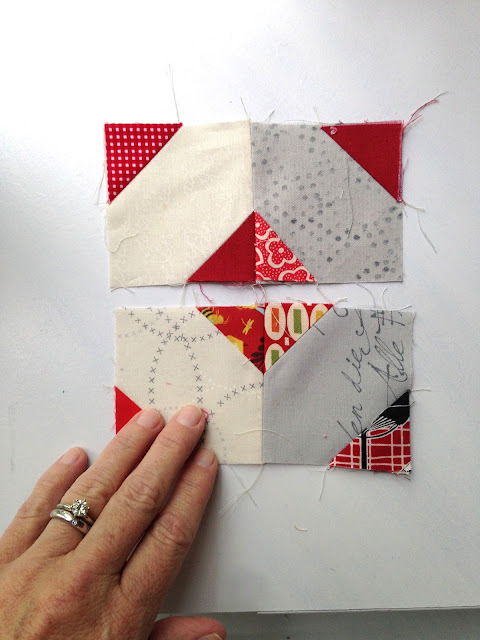 To make these fabulous blocks is so incredibly easy! 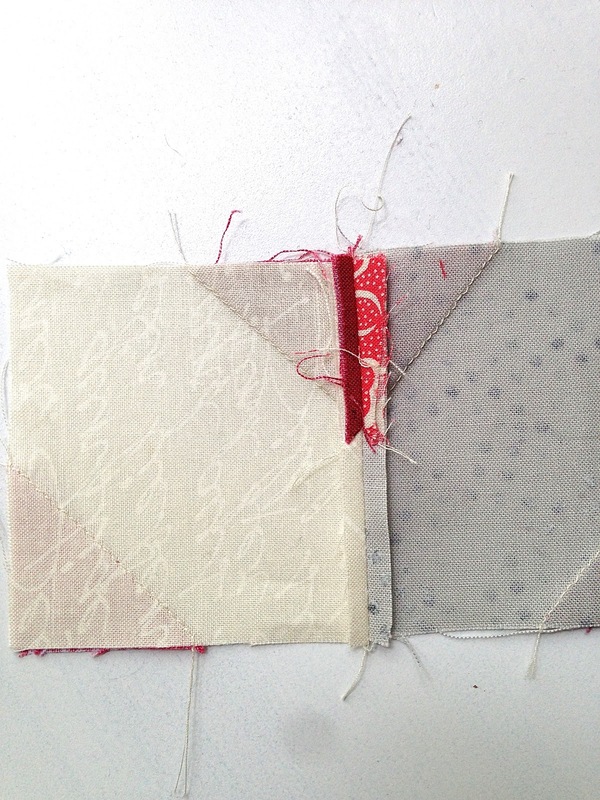 I used Zen Chic Modern Background in Paper and Ink for Moda Fabrics. I am piecing using Aurifil 50wt in a nice neutral color. Cut four 3 in square and eight 1.5 in squares. Use 1/4 in seams. The unfinished block size is 5 1/2. To save even more time (and thread) chain piece as you go! Press the seams to the dark side. Sew two of the units together and press seams open. You will now have two rectangle units. Line the two rectangle units up, matching the center seam and the two angled seams, pin and sew together. Press and you will have this lovely block! SO EASY!!!! Today, I also had the great pleasure of listening to and meeting Mr. Bernina, Hanspeter Ueltschi, at Suzzie's Quilt Shop in Manassas, VA. The participants has tons of questions and Mr. Ueltschi had many answers! After the talk, it was on to signing machines, books and just about everything else! 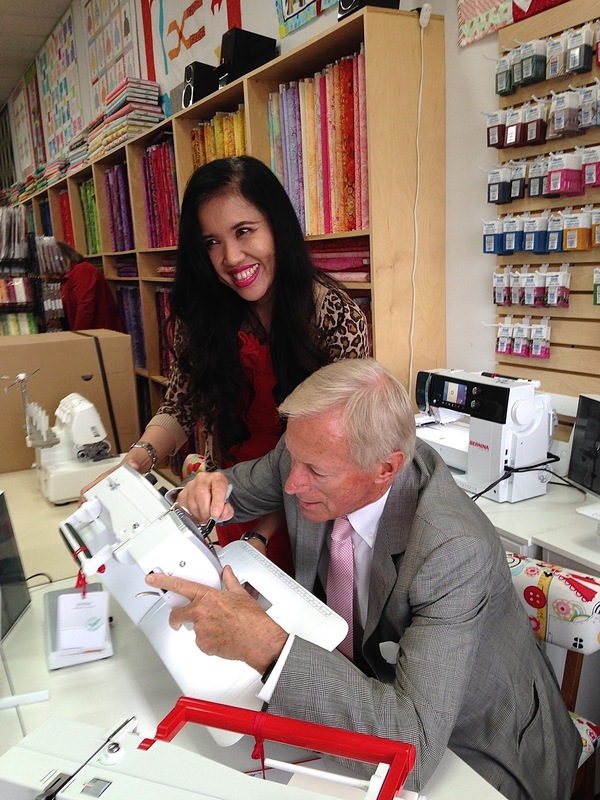 If you want a beautiful new Bernina signed by Mr. Bernina, call Susy! 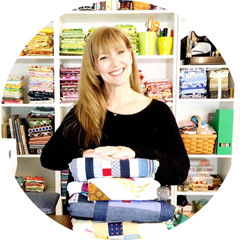 This local quilt shop( support your local shop) also offers a great selection of thousands of bolts of fabrics, notions ( Aurifil) and classes. She will be moving soon to a bigger lovely space a few doors down soon and will have even more to offer her quilters! Looking forward to seeing it in a few months! Many thanks to Susy and her staff ( knowledgeable and helpful) and to to Mr. Bernina for making the trek to VA! It was a fun morning. 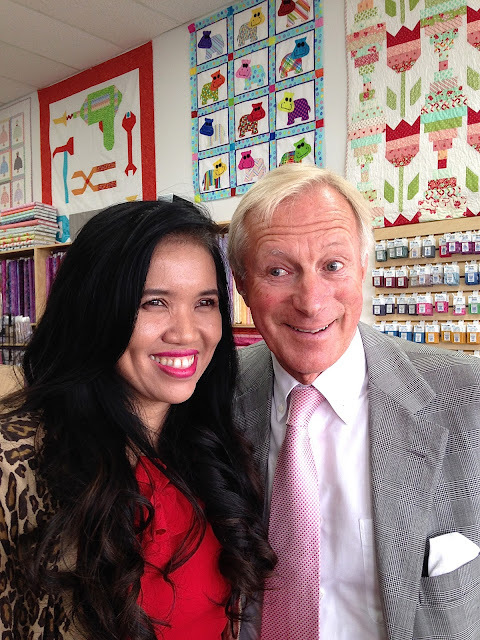 Wow you got to meet Mr Bernina! I have 3 Berninas. I would love to upgrade to a newer machine but they are so well built I can't justify it as there is nothing wrong except I want more technology. I do take really good care of them.